Looking for a fun way to ring in the New Year? If warmer weather and coastal fun sound like how you want to greet 2018, then look no further. 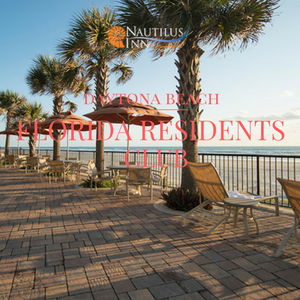 New York City’s Times Square may be known for its big crowds and sparkling ball drop, but there are plenty of bright and exciting celebrations happening right here in the Daytona Beach area. Ahead, read up on some of this year’s most dazzling soirées, and start planning your holiday getaway today! 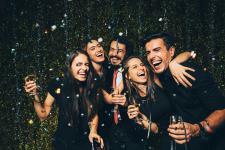 Celebrate New Year’s Eve with DJ entertainment, dancing, complimentary food and cocktails, Champagne toast, party favors and more at Nautilus Inn! 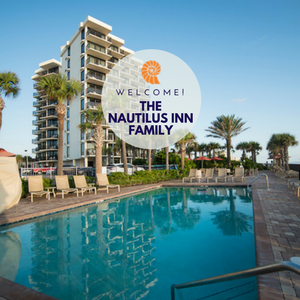 When your New Year's Eve celebration is over, you will love retiring to your spacious, deluxe room at Nautilus Inn! The best way to begin a New Year - you'll awaken on the first day of 2018 with a beautiful view of the Atlantic and our complimentary deluxe breakfast. Click here for details! From: 6:30 p.m. to 12:30 a.m.
Head to South Daytona to swing into the New Year! Join Gold Star Ballroom for a night of dancing, showcases and champagne toasts. A buffet-style dinner is included in your ticket price, and entertainment will be plentiful. Put on your most comfortable dancing shoes, grab a partner, and have some fun. The attire will be semi-formal, and requests to attend are required by December 22, 2017. From: 5:30 to 7:30 p.m. and 8:30 p.m. to 1 a.m.
A new year may be approaching, but you can celebrate the sounds and songs of days past with an evening at 31 Supper Club. Famed Las Vegas impressionist and living legend Bob Anderson will be entertaining the people with not one, but two shows on New Year’s Eve. He’s a six-time Las Vegas “performer of the year,” and he’ll be right here in Ormond Beach. Each ticket includes a 4-course meal and a bottle service. Whether you attend the 5:30 or the 8:30 p.m. show, you can get his autograph at 8 p.m.
From: 9 p.m. to 3 a.m. Kick off 2018 with a beachy breeze hitting your face. Conveniently located in the heart of Daytona Beach, the New Year’s Eve Party at Ocean Deck promises to be a fun time. Join the restaurant’s New Year’s Eve party and enjoy a bonfire on the beach, live music, free party favors, complimentary champagne toasts and fireworks off the pier at midnight. From: 8 p.m.¬ to 1:30 a.m. The heart of Daytona Beach will be buzzing with excitement this December 31. Main Street will be pedestrian-only all evening, while you say goodbye to 2017. Don’t miss the stilt walkers, live bands and DJs, and the illuminated ball drop at midnight. The street will be lined with a wide variety of food and retail vendors, guaranteeing that partygoers will be well-fed. Head to the oceanfront Bandshell for more festivities, and find the perfect spot to view fireworks launched from the pier. It’s the ideal way to start the year with a bang!